Everyone seems to have a meatloaf recipe – perhaps one handed down through the family, the meatloaf that grandma used to make. It may be blasphemous to say this, but I have no fond “meatloaf memories” from my childhood. I know my mother made a meatloaf, but other than remembering that I like the crusty end-pieces, I have no recollection of how it tasted. Having no family recipe to rely on, years ago I found a meatloaf recipe in Molly O’Neill’s New York Cookbook that I have since adopted. Yes, Bill Blass is a member of my culinary family, because my meatloaf recipe is heavily borrowed from his. This meatloaf always comes out moist, probably due to the addition of sour cream in the mixture and because it is covered with bacon and barbeque sauce. Because of my fondness for meatloaf crust, I like to bake this free-form in a roasting pan for maximum surface area. Look at that nice sear on the bottom of the loaf too…mmm! So without further ado, my meatloaf recipe (modified from “Grandpa Bill’s”). Preheat oven to 375F. Line a shallow roasting pan with foil and spray lightly with oil. In a skillet over medium-high heat, saute the onions in coconut oil/bacon grease until soft. Remove from heat and set aside to cool a few minutes. Place meats, sour cream, bread crumbs, parsley, thyme, marjoram, salt, and pepper to a large bowl. Mix in onions and fat from the skillet. Toss ingredients together to lightly mix. Whisk eggs with the Worcestershire sauce and add to mixture. Using your hands, combine the mixture well using a kneading-like motion (but try not to overwork it). Form into a loaf shape and place in roasting pan. Bake for around 30 minutes, then remove from oven. Pour off accumulated fat, if needed. Place several strips of bacon lengthwise across the meatloaf. Return to oven and bake for about 15 more minutes, or until the bacon is getting crispy. Remove from oven (drain fat again, if needed), then slather with barbeque sauce. Bake for another 15 to 20 minutes. Remove from oven and let it rest for 5-10 minutes before serving. What goes good with tasty meatloaf? Why, tasty blues of course! Although he’s not as well known as the Claptons or Jeff Becks of the blues world, Michael Bloomfield was every bit as good when in his prime. Take a listen to Live at Bill Grahams Fillmore West 1969 and hear some of the most emotive, smokin’ guitar you’ll ever find. Bloomie was peaking in the late ’60s, early ’70s and this is a prime example of it. This next one is harder to find, but well worth the hunt- It’s Not Killing Me . Granted, his vocals leave a bit to be desired, but when he dug into that sunburst Les Paul, he had few equals. Well your meatloaf recipes is for sure different than my current one. Will have to try, like the bacon idea and then smothering in BBQ sauce, sounds really good. Looks delish and I love that your recipe is gluten-free. I love meatloaf and it’s been sooo long since I’ve had any, I decided to add your recipe to my meal planning today! Came out great!!! 🙂 Thanks so much for sharing. The main picture is so mouth watering!! Thank you Cate! The little baby meatloaves you made are the cutest things ever. I’m glad they turned out well! Thanks for the shout out too! This looks mouth-watering! …any substitute for the gluten-free bread crumbs? Almond flour, maybe? Thanks, Alex! I think almond meal or almond flour will work fine, although I would use about half the amount since it is more dense. You could also leave it out altogether and I believe the recipe will still work. I only like the bread crumbs because they seem to improve the texture of the meatloaf (less like a meat brick). One thing that does NOT work is flax meal, which I tried a long time ago in a misguided adaptation. Yuck on the taste of that…threw out a whole meatloaf. 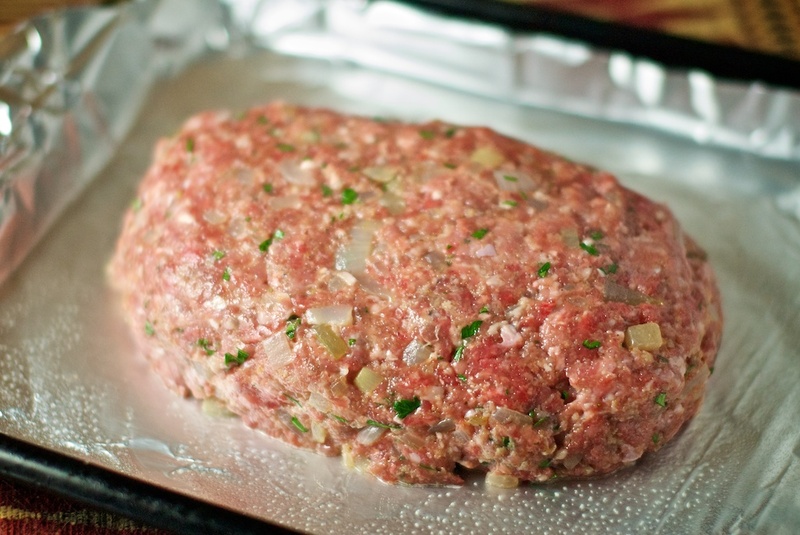 I tried this recipe this weekend, substituting ground pork in place of veal, and Green oregano for marjoram. I also sauteed the onions in olive oil. My family LOVED this!! Mom stated, “you are going to have to make this one again”. It is now MY favorite meatloaf recipe, and so easy. Thanks for sharing. I just finished some for lunch and my tummy is very happy. oops! that should have read Greek oregano, not Green. And fresh picked from the garden. I’m so glad you and your family enjoyed it! It is very flexible on the ingredients…I’ve made it with pork also (or all three meats) and I bet the fresh oregano was very good, being both Green and Greek. 🙂 Thanks for the comments! Hi! This looks great, but doesn’t worcestershire sauce have wheat in it? That may be a little misleading… maybe there are types out there without it. If you’ve found any, let me know! OMG YUM!!!! Just made this for my boyfriend and I. We both loved it. Only changes I made was ground turkey instead of veal. It really was delicious. Only thing I’m going to try next time is instead of BBQ sauce I’m going to do a ketchup, mustard, brown sugar topping instead. Thanks! this is a stupid recipe. any meatoaf that requires “pouring off excess fat” during cooking TWICE has too much fat. the purpose of adding ingredients like bread crumbs & eggs to a meatloaf are to bind it together. adding things like sour cream (which frankly sounds gross) & the oil in which the onions were cooked defeats this purpose as the meat has fat in it already (which is why meatloaf recipes often contain mixtures of lean & more fat ground meats.) bacon for flavor is fine i suppose but the person who created this recipe knows nothing about cooking. Tell it to Molly O’Neill, Fred Johnsen…she put this recipe in her book. It is delicious, but I suppose you decided to criticize without trying it first. Your loss, dude. I often mix up the meat mixture differently depending on what I have in the freezer. I like it with beef/pork/veal too! Thanks for commenting! This entry was posted on May 18, 2011 by She cooks...He cleans in Beef, Entrees, Pork, Veal and Lamb and tagged bacon, barbeque, BBQ, dinner, gluten free, grass-fed, low-carb, meat, meatloaf, Mike Bloomfield, New York Cookbook, paleo, primal, recipe.